The A7 Diamond Thermal-Neutron Monitor is designed for the measurement of the neutron flux in thermal neutron beams. A highly enriched 6LiF layer is used as thermal neutron converter, where the 6Li(n,α)3H reaction is used for neutron detection. The monitor is optimized for high count rates and allows using cables up to 10 m length between detector and amplifier, to enable the usage in high-radiation environments. with integrated power supply and GUI, for real-time neutron flux measurements. Slim detectors with Ø12 mm for confined spaces. Temperature resistant detectors up to 500 K.
The A7 Diamond Thermal-Neutron Monitor can be adapted for application where particle discrimination is of interest. With the ROSY® AX106 n-γ Discrimination Application, background photons are rejected in real time with an efficiency of 99%, for a puristic thermal-neutron measurement for count rates up to 3 MHz. The Figure shows results from a measurement in the thermal neutron beam at the Institute of Atomic and Subatomic Physics of TU Wien, Vienna/Austria. 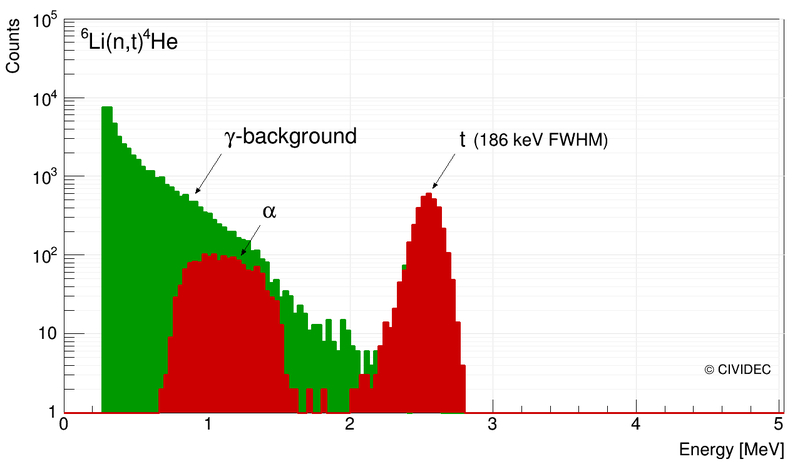 Despite the high photon background from the reactor, the α particles from 6Li(n,α)t could be extracted from the spectrum. A reactor physics research campaign at the CROCUS reactor at EPFL, Lausanne/Switzerland, has led to the development of our compact design detectors. The A7 Diamond Thermal-Neutron Monitor is used with a compact B6-C detector for in-core measurements at this research reactor. ROSY® provides the spectra of thermal neutrons, γ and fast-neutrons in real-time with the Selective Spectroscopy Application.